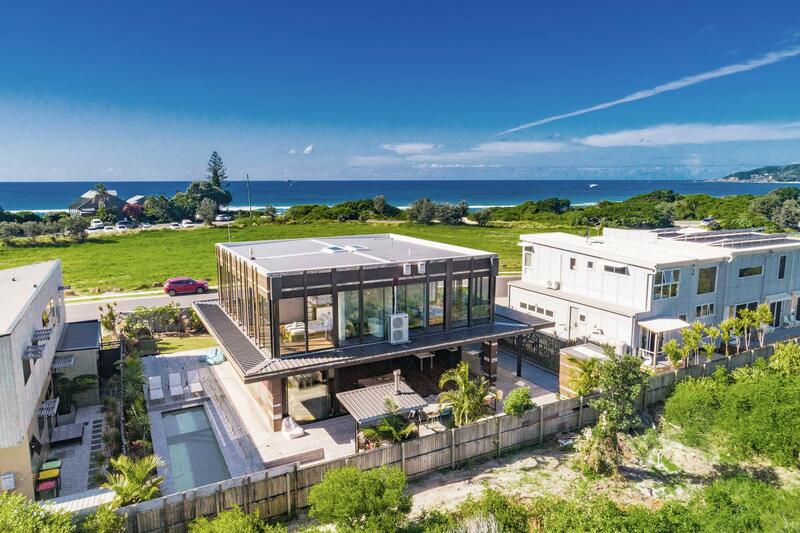 Presenting Beach Box - a stunning 4 bedroom + 5th rumpus room/bedroom, 5 bathroom modern, minimalist holiday house, located only 100m from beautiful Belongil Beach. 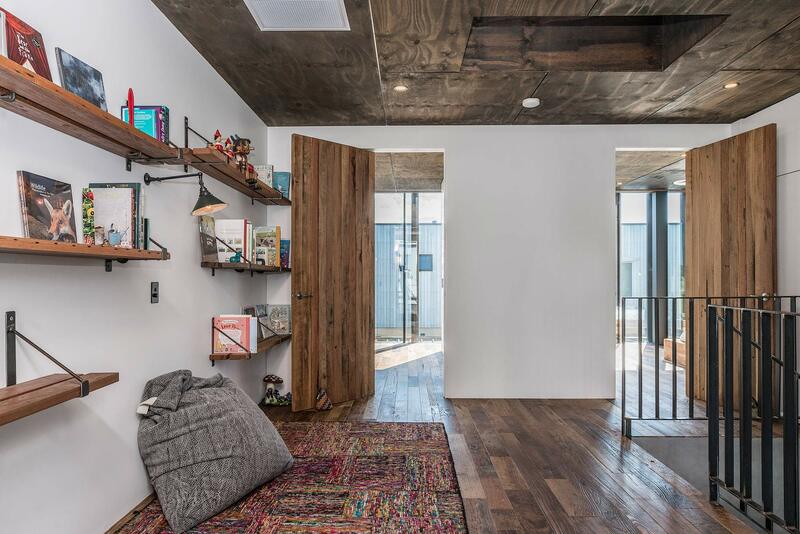 Impeccably styled in luxury-industrial interiors, this stunning home features maximum glazing for the ultimate light-filled illumination. 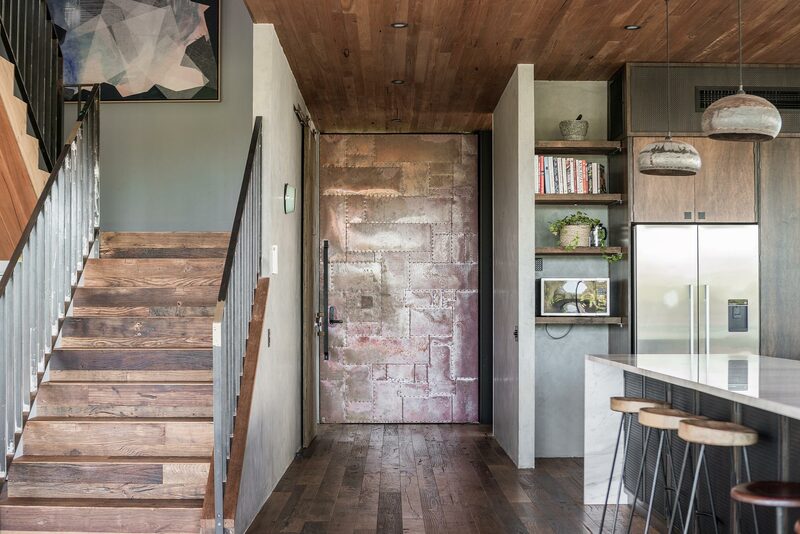 Downstairs, sweeping timber floors and ceilings encase a large open living and dining space, minimally furnished and seamlessly flowing through wall-to-wall glass stacking doors to the outdoor space beyond. A sleek modern kitchen features high-end appliances and there’s an additional toilet and powder room for guest convenience. 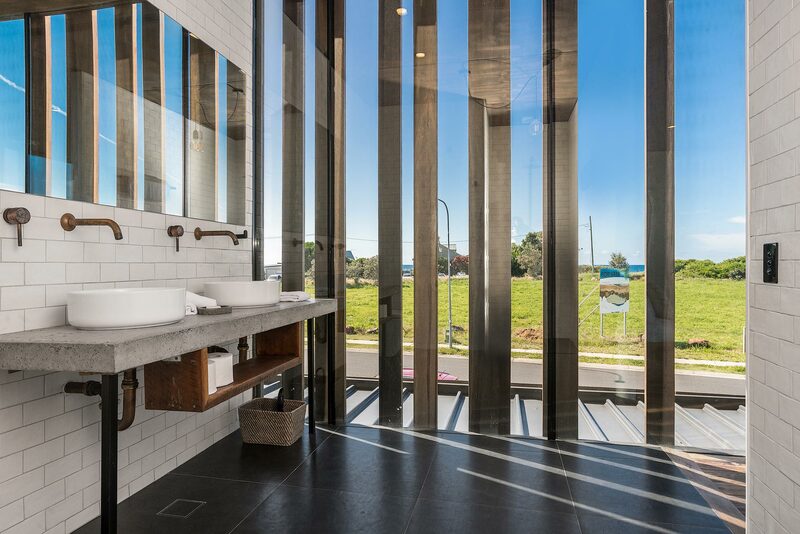 Upstairs, 4 spacious resort-style ensuite bedrooms feature glass panels that open to uninterrupted panoramic views, sweeping across the Byron coastline to the iconic Cape Byron Lighthouse. A large rear deck promises sun soaked outdoor dining, with BBQ, dining setting, fire pit and built-in seating. 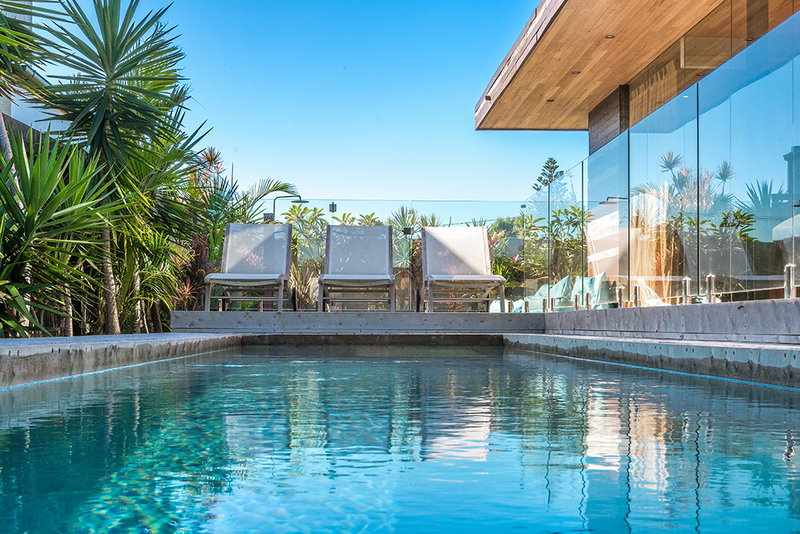 A spectacular 9.5m swimming pool sits adjacent to the home, with views to the tropical Hinterland beyond. From this amazing location, walk only 20 seconds to Belongil Beach and drive in less than 5 minutes to Byron Bay town. 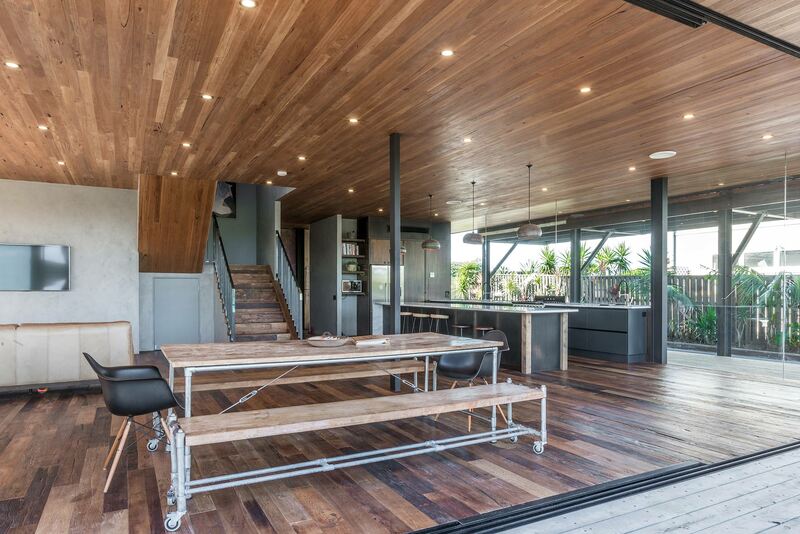 Large and open plan, the living and dining area showcases stunning timber floors and ceilings and flawless modern finishes. An indoor fireplace adds to the ambience on those chilly nights. A Bluetooth speaker system is provided for guests to enjoy their own selection of music. 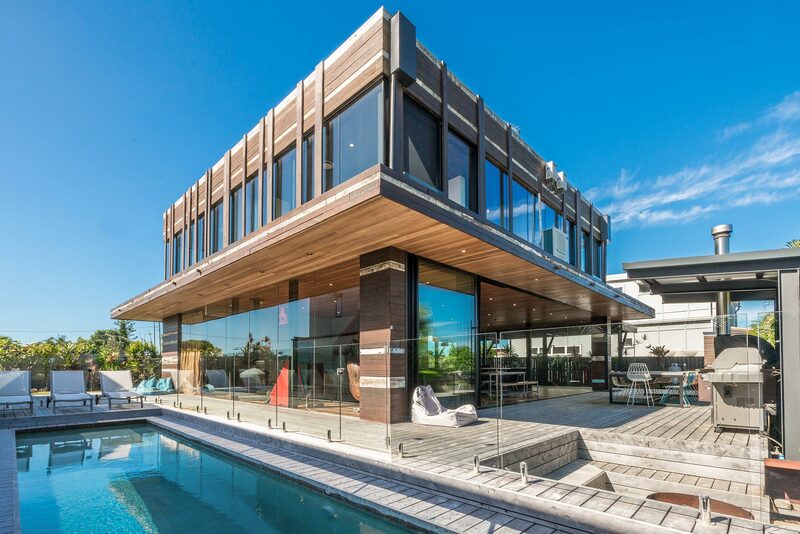 In an absolute mastery of the the indoor-outdoor flow, this wide-open space opens out entirely to reveal sun-drenched outdoor decking via wall to wall stackable glass doors. Simple and stylish furniture includes a luxurious leather lounge and a long industrial style timber dining table with bench seating. There is an additional chill-out area upstairs complete with beanbags and books. Make meals and memories in the huge galley style kitchen with a sleek and modern industrial interior and stainless steel appliances including double door fridge with water dispenser, wine fridge, and large gas cooktop. 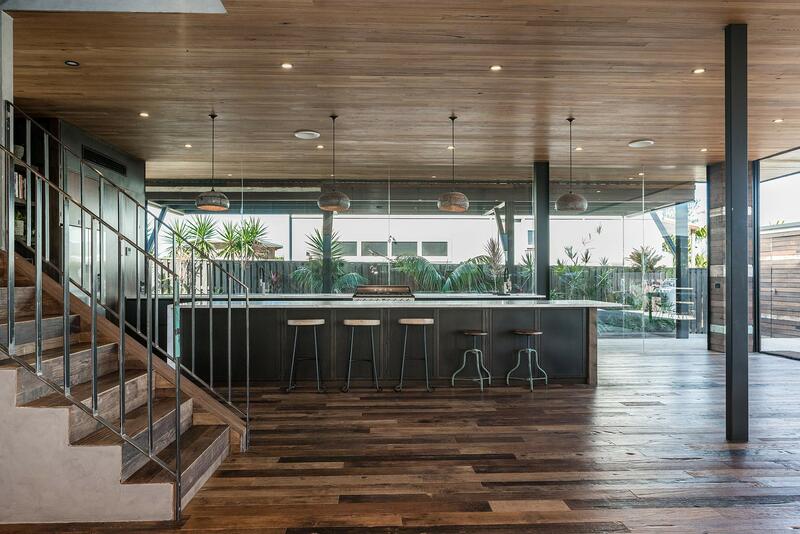 Bench to ceiling glass allows maximum natural light and a large island bench, illuminated by modern pendant lighting, offers breakfast bar seating for 5. 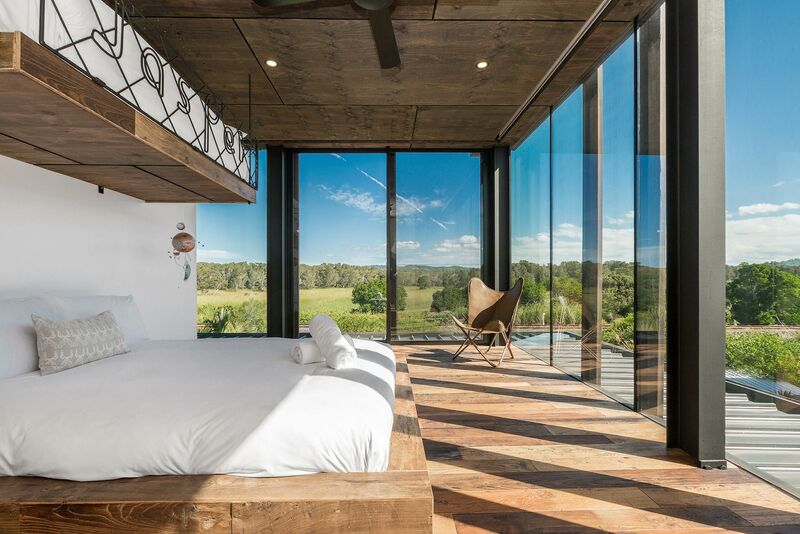 Sleep in five star, resort style luxury with 4 spacious bedrooms + 5th rumpus room/5th bedroom, all with ensuite bathrooms. 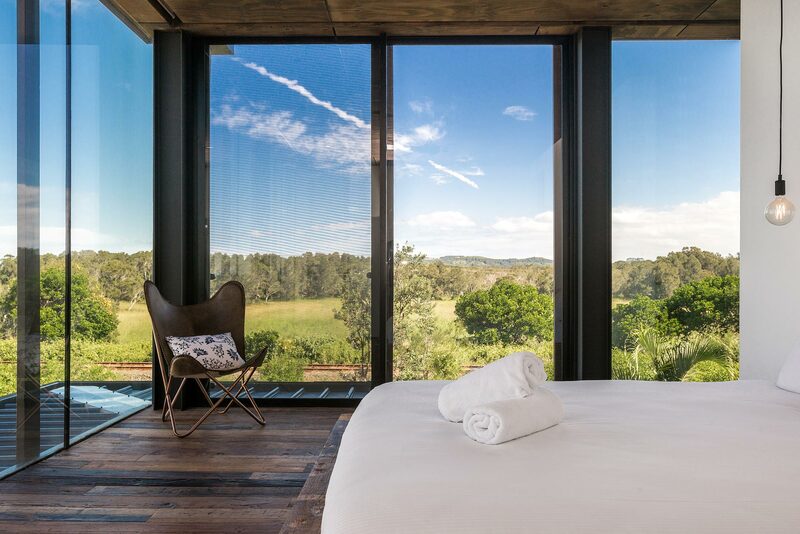 Styled in spectacular simplicity, with maximum glazing for light-drenched luxury, the bedrooms feature timber panelling, pendant lighting and glass panels opening out to reveal the stunning views of Byron Bay’s beautiful Belongil Beach and hinterland. Beds are for ultimate comfort and include latex pillows and latex top layer mattresses. 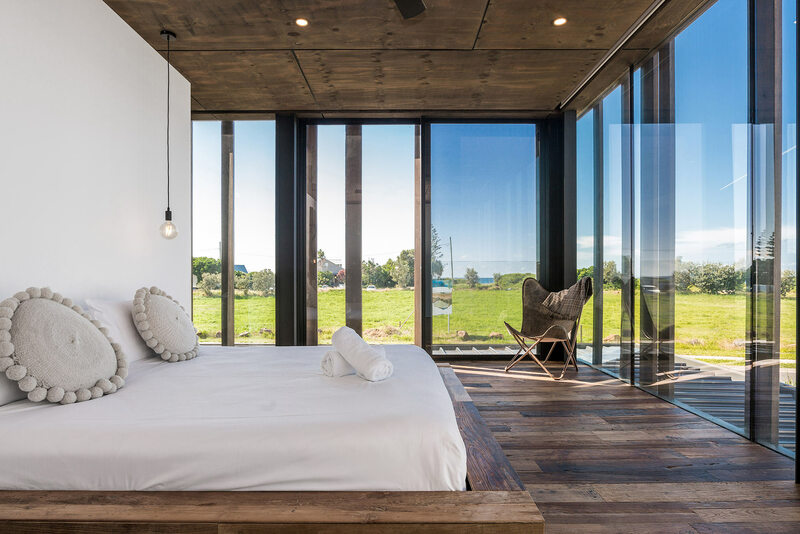 Transport yourself to a luxury day spa when in one of Beach Boxes 5 ensuite bathrooms. 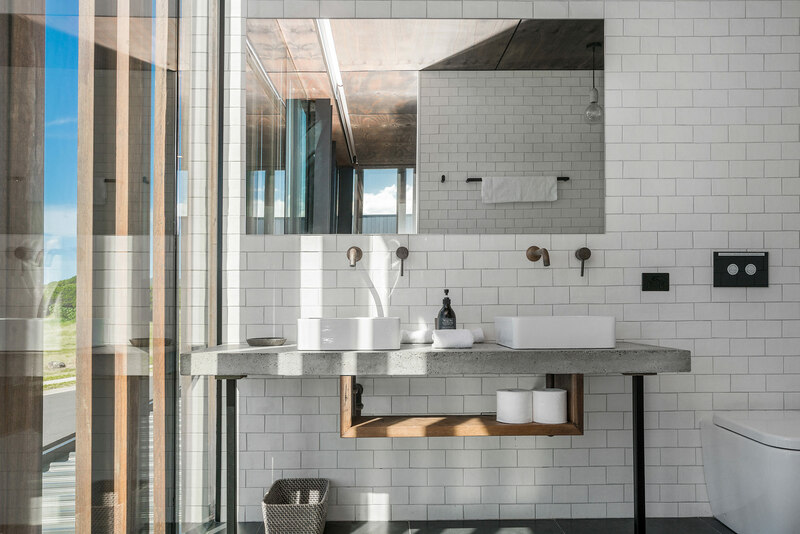 Showcasing elegant industrial interior style, the bathrooms feature concrete vanity tops, timber ceilings and exposed copper piping. 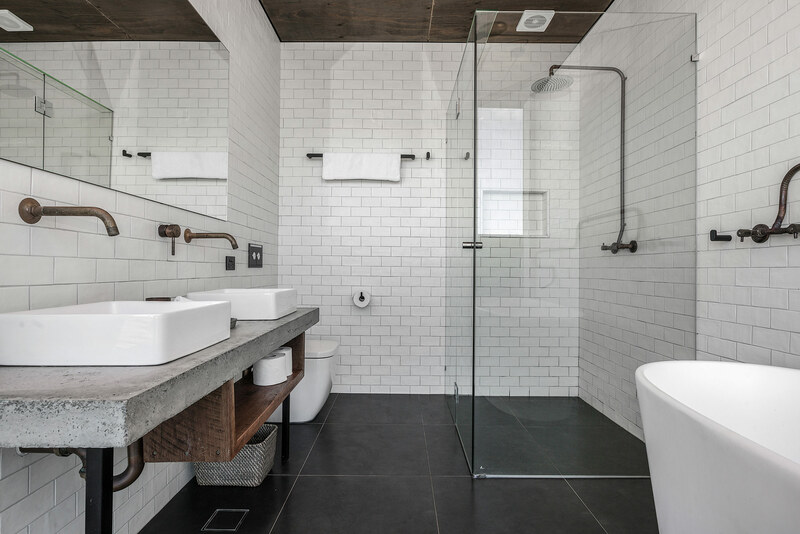 Two bathrooms include a deep freestanding bath. There also is an additional guest toilet, as well as an outdoor shower. 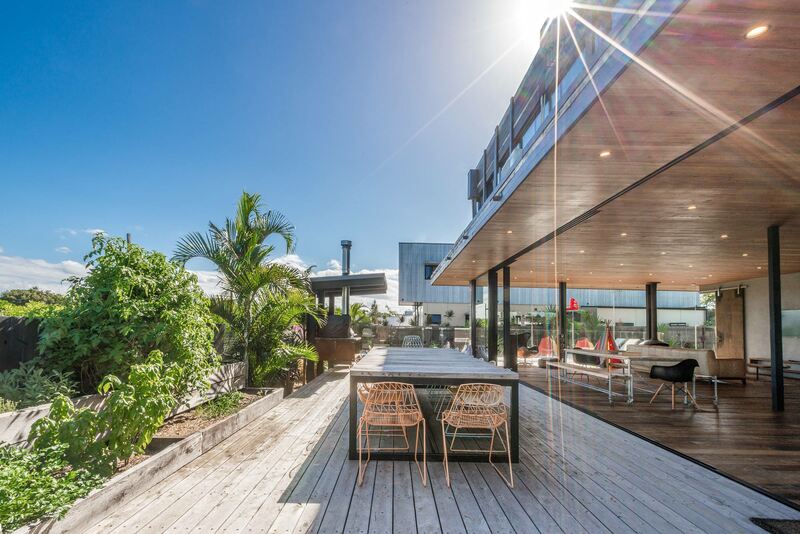 Relax on the sun-drenched rear deck area, backed by tropical Hinterland - perfect for capturing the most spectacular Byron Bay sunsets. Entertain and enjoy a BBQ, dining at the long rustic timber table with modern outdoor seating adding pops of bright summer colour. Outdoor beanbags are also provided for guest comfort. 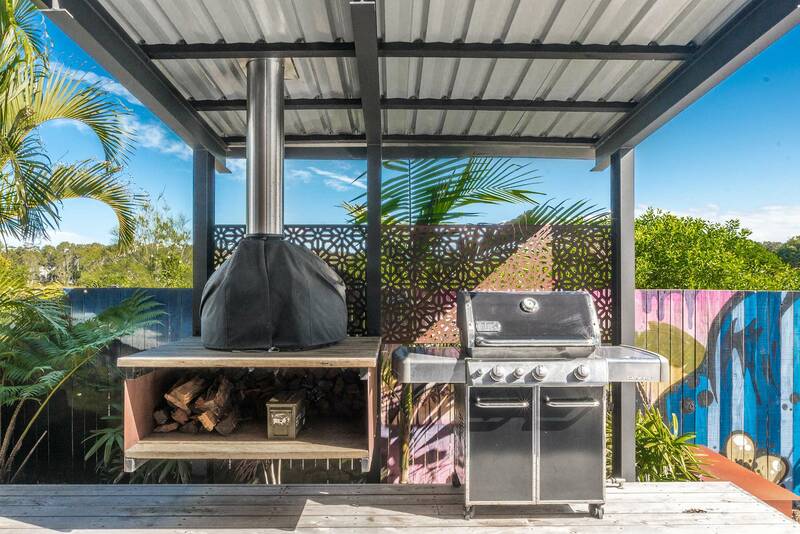 Adjacent to the pool, a sunken seating arrangement is built into the timber decking and converges around the open fire pit, illuminated by brightly coloured murals painted on the perimeter fencing. At the front of the property is a grass lawn, perfect for kids to play, as well as a newly established herb garden to accompany your meals. Luxuriate in the resort-style pool area, which is set in timber decking, with lush sun loungers, all framed by tropical gardens. Swim in the private 9.5m lap pool, which is includes a shallow end for kids and a very deep end for plunge style swimming. 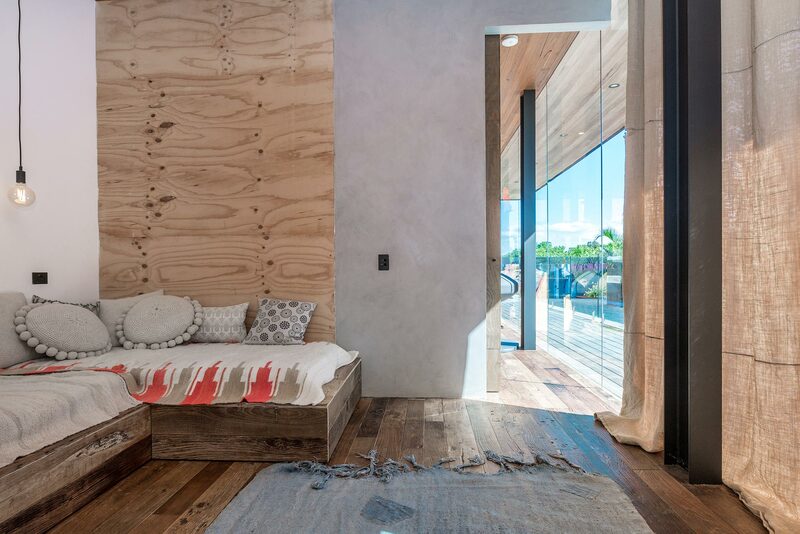 Superbly located, Beach Box sits along the shores of Belongil Beach - wander only 100m across the road to access this beautiful piece of Byron Bay coastline. Dine beachside at the funky, family-friendly Treehouse on Belongil, offering delicious eats, licensed bar and live music only moments up the road. 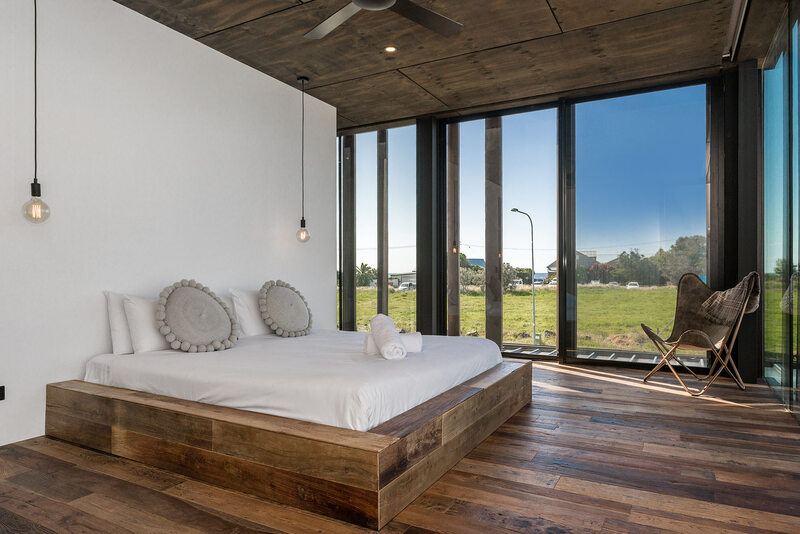 Beach Box is located less than 2kms from town - drive under 5 minutes to the bustling retail, dining and entertainment precinct of Byron Bay or walk along the beach to all Byron has to offer. Intimate events, photo/video shoots may be arranged directly with A Perfect Stay. Additional fees and T&C’s apply. Christmas and New Year Bookings: If dates include both Christmas Day and New Year's Eve a 12-night min stay applies, unless otherwise approved directly with the host. It was great to have a pool at the house for when it was too windy to go to the beach. We really loved the house and would stay there again. Loved it all. 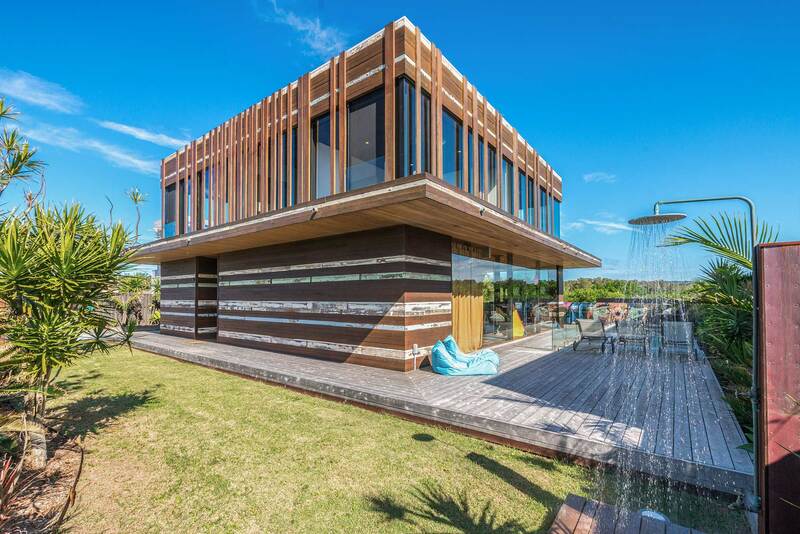 Fabulous house, loved the beaches, excellent restaurants and cafes. Can't wait to re-book! We loved the house. 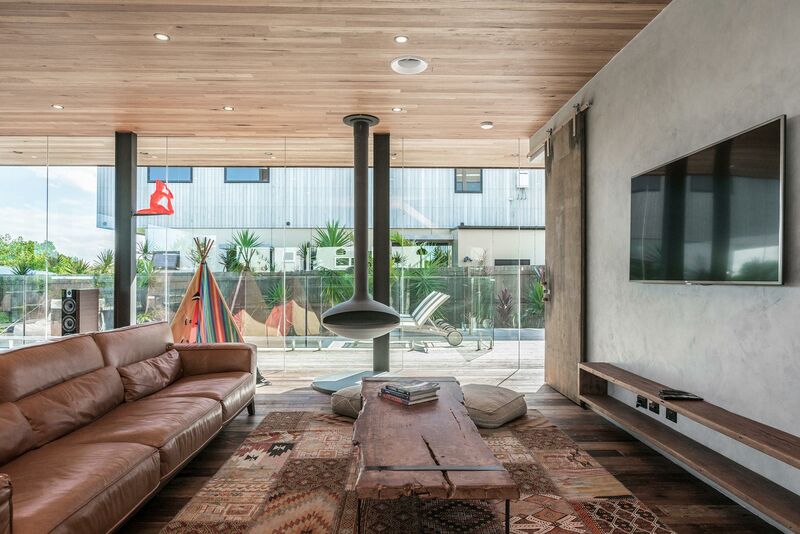 The location, comfort, it fits out and overall vibe just like Byron Bay itself. Totally relaxed and fabulous! It had everything we needed. The property management was seamless and responsive. Want to come back next year!